Well, let's kick off the giveaways for this Lucy Maud Montgomery Reading Challenge correctly now, shall we? Of course, we must start with LMM's most popular and well-loved character (sorry Emily fans!) - Anne of Green Gables. Anne is my hands down favorite of all of Montgomery's characters and, quite shockingly, I still discover people every year who have yet to meet this red-headed marvel. So I keep picking up gently used copies to pass along to potential readers in order to share the joy of knowing Anne. 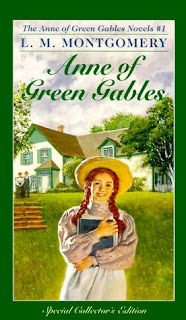 I have a copy of Anne of Green Gables that I picked up to give away to one of you. It's a Wordsworth Classics edition (not the one pictured) but is in excellent condition. Would you like to win? Have you not read Anne? Well, then you must! I'm taking away reasons for you not to! Please simply leave a comment below vowing to read this book should you win it. This contest is open to US AND Canadian residents and will be open through next Thursday, January 13th. I will announce the winner for this contest and present you with another opportunity to win another Montgomery-related item on Friday the 14th. If you are participating in the Lucy Maud Montgomery Reading Challenge and have left me a comment/link saying so, feel free to enter twice! Wouldn't mind another copy here since my paperback has seen its better days! Yes! I want to read this book!!! I'm in the challenge, too! I would love to win this for my daughter, she always loved Avonlea on tv but I don't think she's read the books. I was just checking in to say that I just finished watching Anne of Green Gables and I completely forgot how much I loved this movie! I must get a copy for my own DVD library! Thank you for hosting this challenge. I'm not sure I would have read/watched this series otherwise this year! :) I must visit with Anne and the rest of L. M. Montgomery's characters more often! I have to admit that I've never read this book. Should I win, I will! I could really use my own copy, since I am borrowing this one from the library! I must admit I have never read Anne of Green Gables. I know it's a classic and I would love to win a copy. Thank you for the chance to win a copy. I just checked out this book from the library for my first-ever read of Anne of Green Gables! I'd love to read and win this book. I have 3 dd who will eat it up! I'd like to read this book and then pass it along to my granddaughter. One of my favorite childhood books! I vow to read and review it. I didn't read this as a child, but as an adult. So very very wonderful. Marilla wanted a boy to help Mathew. Please include me! To tell the truth, I can't remember if I've read this book or seen the movie. I have a lot of "senior moments" at age 72. I certainly would like to read it and share it with my granddaughters. Thank you for offering this classic as the giveaway; and for the chance to win it. I hope I do win! Hi Carrie, I joined the challenge and looking forward to the fun. I am posting your blog to my blog. I publicize only one giveaway per day, and today you're it!